dfcu Bank board members with Agribusiness Development Centre and Rabobank Foundation executives show off the $2.8 million cheque for the ADC. Photo by Badru Afunadula. 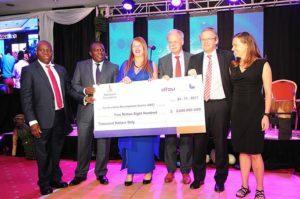 Farmer Based Organization’s (FBOs) that have potential to contribute to the agricultural value chain finally have a chance at improving their operations, thanks to a $2.8million (about Shs10.1billion) grant from dfcu & Rabobank Foundation in Netherlands through the Agribusiness Development Center (ADC). ADC was started in October this year has skilled 44 farmer leaders from 20 FBOs from Lira, Dokolo, Kole, Alebtong and Oyam with skills in governance. According to the ADC executive director, Anja de Feijter, the ADC business advisory team is pre-visiting over 100 farmer based organisation’s (FBO’s) countrywide in 2017. Since October, 70 FBOs have been selected to receive the training skills in governance; financial management; financial literacy; marketing; risk assessment and so much more. “With these skills, the Farmer Based Operations will continue to grow their operations in ways that are of benefit to both them and the wider communities,” she added. Speaking at the official launch of ADC in Kampala today, dfcu Bank Chairman of the Board Jimmy D. Mugerwa, commended the efforts being taken by the farmer based organizations to acquire finances through forming groups. “Agriculture is the number one breadwinner for our country and there is need for collective effort to support it. By facilitating ADC in its operations dfcu and Rabobank are building capacity for the farmers to access much needed financial services, he said. “dfcu Bank already provides tailor-made products for the farmers and with the capacity building delivered through ADC the small holder farmers will be more eligible for financing from commercial banks. They will also be better placed to increase productivity and possibly embrace commercial farming which is more profitable at household and national level,” he added. The launch was presided over by His Excellency Henk Jan Bakker, the Ambassador of the Kingdom of the Netherland who is also the patron of the ADC. The Agriculture Development Centre started its operations in October 2017 in Eastern, Western, and Northern Uganda. Lira is the first District whose Farmer Based Organizations received two-day training in the introductory module for cooperatives. ADC envisions promoting self-sufficiency as an effective tool to transform the agricultural sector in Uganda.